So let me explain the setup. For each word or phrase I want to study, I create a separate task that is set to repeat every two days. In the task name, I have the english word and in the notes I have the word in Japanese with the romaji. When I study, I don’t look at the notes until I want to double-check my answer. If I’m right, I increase the repeat of the task by a day. If’ I’m close, I leave it as is. If I’m wrong, I decrease the repeat by a day. That way, I practice words I’m not learning more frequently and words that I do know naturally move out to show up less frequently. I’ve been using this system for a couple of years and it’s working pretty well. Currently, I have hundreds of words that in my rotation with anywhere from 30-50 on the list for each day which keeps things manageable.Â The romaji text is deliberately in a light color so that I focus on the word in Japanese (hiragana or katakana). The only downside is that I’m only focusing on English to Japanese. I need to reverse the many of them to increase my recognition of the Japanese words themselves. Any other ideas for improvements? 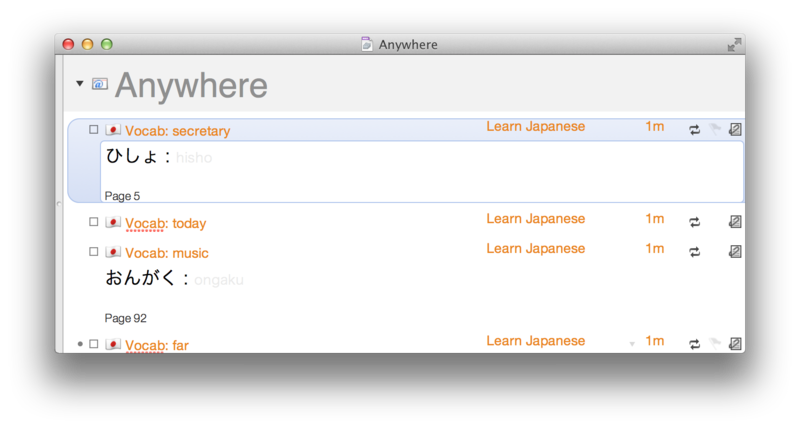 This entry was posted in Geek, Macintosh, Productivity, Thoughts, Work and tagged OmniFocus by Mike. Bookmark the permalink.